I went to a sushi party once in first year uni, but I hated vinegar so my friends made the rice with no vinegar. The sushi was pretty average, and I didn’t bother trying sushi again. About a year after I had been vegetarian (and shortly before I went vegan), I was at an event and thought I’d give the sushi a go. It was amazing, and I have been obsessed with it since. It makes a fantastic “I have no leftovers! What shall I take to work?” sort of lunch, and makes a pretty good change from sandwiches (which can also be pretty awesome). Aside from obvious things, you will need a bamboo sushi mat. You can buy this in your local Asian supermarket (or even in most Woolies/Coles). Metal spoons can apparently change the flavour of the rice, I can’t verify this as I use wooden spoons but I have heard the metal reacts with the vinegar or the mirin. So that’s your myth to consider, if you so wish. Bring the rice and water to a boil, stirring, then reduce to really low, and simmer for ten or twelve minutes with the lid on. Prepare the veggies: julienne carrots, snow peas, capsicum, and cucumber. I like to slice the avocado width-ways, and take the tails off the bean sprouts. When the rice is soft and cooked, remove from heat. Stir the vinegar and mirin through, and cool. I like to do this with a paper fan whilst stirring, but if you’re feeling lazy you can just leave it to cool in the air. Place a nori sheet on the bamboo mat with the slats running horizontally. Make sure you have it on the right side, or you won’t be able to roll. This should be the side closest to you. Keeping the nori right up against the edge of the bamboo mat, spread about a third of the rice in a thin layer across about one half to one third of the nori on the side closest to you. Then lay out the filling across no more than the bottom half of the rice (ie, closest to you). Moisten your hands (I usually have a small bowl with a little water in it handy) and firmly roll the bamboo mat. 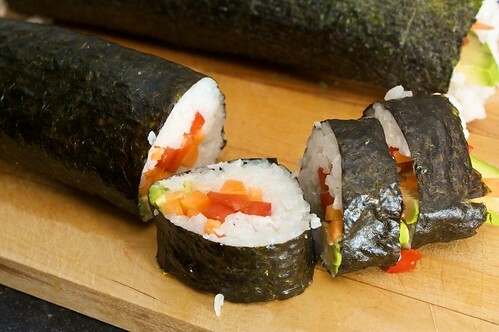 The nori will roll within the sheet. This is much easier than rolling without. There shouldn’t be any seaweed swirl going on, if the proportions are right it should just roll together without a swirl. As you can see from these photos, I misjudged the ratio of rice to filling just slightly, so resulting the opposite problem to swirl, which is filling nestled next to the nori. This amount will usually make about two or three rolls, depending on how fat with rice you like your sushi. Of course it is not necessary to strictly stick to these fillers and proportions, I have just provided them to give some idea of amounts. I want to try the five spice tempeh as a filler, I think it will be excellent with some avocado and bean sprouts. Last week I made five-spice tempeh twice in a couple of days. The first time I served it more traditionally, with rice and gailan and things, but the next day the weather was quite warm and I’m trying to get more into salads this summer, so thought I’d try my hand at a pasta salad. Prepare the tempeh (link). Don’t clean the wok after frying the tempeh; instead, add a little more peanut oil and fry the mushrooms. Due to the method used for the tempeh, there should be crispy spiced bits floating about in the oil. This will give the mushrooms a slightly spicy, wok-hei sort of flavour. Combine the lemon juice, garlic, chili flakes, (hot) vegetable stock, vinegar and sesame oil. Mix until well combined. 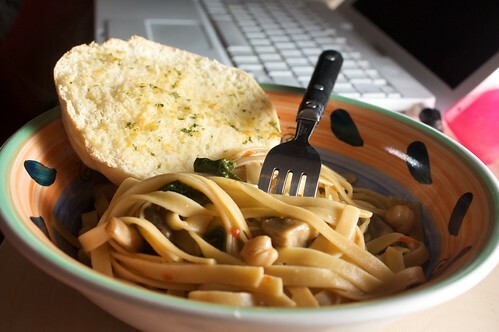 Drain the pasta, rinse in cold water, and in a large serving dish combine with avocado, tomatoes, beansprouts, snow peas, mushrooms, and spinach. Pour in the dressing and mix well. 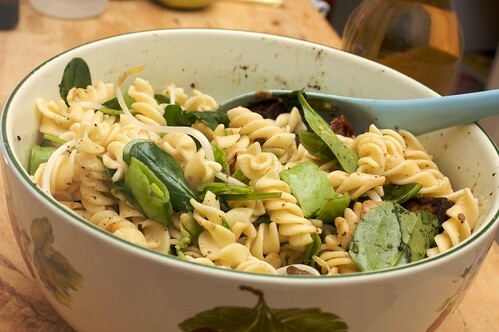 Leave to soak in for a few minutes, top with tempeh and serve whilst the pasta is still slightly warm. This time around I used baby spinach, but not-baby spinach will work fine. Wandered to Mirrabooka for a Diwali Mela on Sunday, came away smelling like masala dosa which is one of those things I’ve never been brave enough to try cooking on my own. My favourite masala dosa this year was the ones I ate at Wawasan Mutiara, crispy and served with with a dahl almost like a rasam. Everyone has a different dahl recipe. My mum likes to add lots of chunky things, big chunks of potato and carrot. Some serve dahl cold, and some serve dahl hot. I’ve had dahl that’s thick and creamy, and dahl that’s, as I said, like rasam. Even my own recipe evolves, subtly changing flavours and texture as I learn new things. But this one is currently my favourite. Overnight, or for about six hours, soak the lentils. I like to use a combination of brown, red and yellow lentils, though in this specific instance I used about half yellow, half red. After soaking, pick out the yuck lentils, rinse and drain. Pound together the shallot, chilli, garlic, ginger, coriander, cumin and tumeric, until a smushy, smoothish paste is formed. On high heat, dry fry the paste for a minute or two, until fragrant. Add the tomatoes and the lentils, allow to fry for a minute or two, then add the stock. Reduce to low, and simmer with the lid on for ten minutes, then add the potato. Continue to simmer on low, lid on, stirring occasionally and adding stock or water as needed. After about an hour, add the coconut milk and simmer with the lid off for another ten minutes. 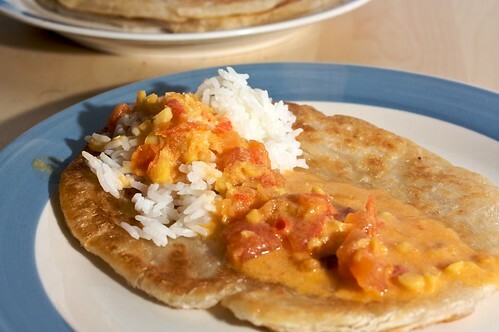 Serve over rice or delicious roti. Yesterday we wandered down to Crawley for the Matilda Bay Craft Fair, which was held on the Oak Lawn at UWA. Having meandered the stalls, we bought some preserves for D’s grandfather and nicked off to Broadway Fair to visit Ararat. 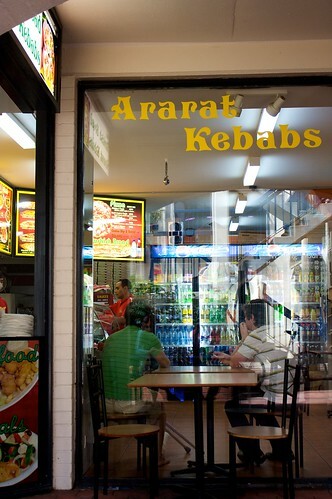 When we used to live down the street from UWA, Ararat Kebabs was a favourite, as it is open until late, and does a fantastic falafel. 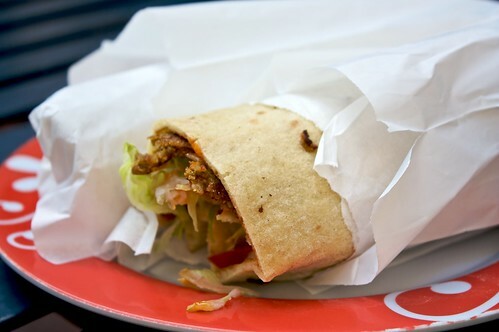 My standard order is falafel kebab with salad (no onion) and sweet chili sauce and hommus, perhaps with some chips on the side. Fantastic! The bread is also pretty amazing, last time we had a party I rang M just before (M lives next door to Broadway Fair) so he could bring some turkish bread with him. The bread there is soft and when you pull it apart you can see the gluten thinly pulling apart. 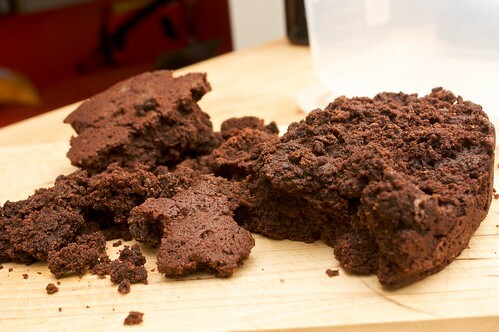 I've been pretty complacent about my gluten-free baking. I've just been substituting directly with Orgran's gluten-free flour. The cupcakes were just fine, and the cookies and biscuits were really great. Deciding that the gluten-free flour made it a bit too dry, for my second attempt I added about an extra eighth of a cup of soymilk. As I was using canned berries, not frozen, I also added about the same amount of berry liquid. This increased the cooking time by about eleven or twelve minutes, and resulted in a half size cake. After sulking around the house for a bit, I worked out I had about three quarters of a cup of choc chips hidden in the fridge, and just enough gluten-free flour for a third try. This third attempt rose slightly, so I decided to put the two together to form a very tall cake. By this point I had been baking for about six hours, and the bottom half was well and truly cooled, so missing the 'spread with jam when still warm' part of the recipe. I decided to just put both halves in the fridge, and that I would deal with icing in the morning. Worried that the cake had dried out a little bit overnight, and that it wouldn't absorb the jam very well since it wasn't warm, I drizzled a little bit of the reserved berry liquid on both halves. I then proceeded as usual, though I softened the icing up a little too much, hence the messiness of the icing. I really should learn how to make a great icing. ETA: home from A's party, and the cake turned out fantastically. It was so heavy and chocolatey, it was just like a chocolate mudcake. 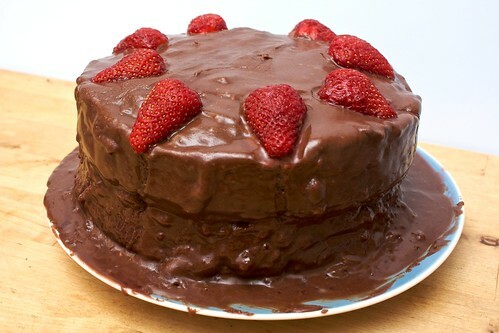 Some people (not vegans) referred to it as being death by chocolate. I'm so incredibly happy with how it turned out! Used this recipe from vegetarian times. I was intrigued because you bake the spaghetti in the oven before boiling it in a broth of harissa and vegie stock. The mushrooms, spinach and chickpeas are also included in this pot at the same time. Because the recipe calls for stirring constantly until the liquid has reduced, I assumed it would go the way of a risotto, ie, super tasty. Sadly, the end result was bland, though the mushrooms were tasty. I used this opportunity to make my own harissa, which was kind of fun. I quite like grilling capsicum, even though our grill is a bit odd. I don’t have a great story for this one, I was feeling unwell yesterday afternoon, so instead of going to my German class I went straight home from work and curled up in bed, so instead of whatever was lying around the house (the original plan), D felt obliged to cook a full dinner before rushing off to band practice. D thought of this on the walk down from West Perth to Woolies in town, and gets full points for awesomeness. It was so tasty, I want to eat it again very soon! Mexican food is not so ubiquitous in Australia, so I don't really have a lot of experience with it. There is usually only one brand of tortilla in supermarkets! 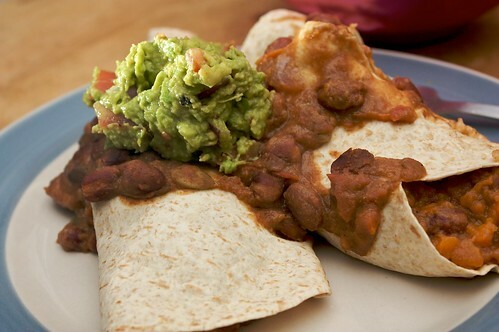 I apologise if you make it and go, "doesn't taste like any burrito I've ever eaten." It is still very tasty. Also I apologise if this isn't actually a burrito, and is infact an enchillada! I took some time deliberating over which it was this morning, but I think the wheat tortilla makes it a burrito. Feel free to educate me in the comments if need be. In some olive oil, fry the cumin, cayenne, paprika and chilli. As it becomes fragrant, add the tomatoes, red onion, and kidney beans, as well as some of the liquid from the kidney beans. Leave to simmer on medium-low, with the lid on, for about twenty minutes, adding water about halfway through if necessary. In the meantime, mash the sweet potato. After twenty minutes, the mixture on the stove should have reduced beautifully. Add the refried beans at this point, and leave to simmer another five minutes. Reserve about a half a cup of the mixture (preferably with minimal kidney beans), and mix the rest with the sweet potato. Divide the mixture evenly into the tortillas, roll and place on a baking tray. Drizzle with the reserved liquid, and bake on 170C for about ten minutes. Because I used full-sized el paso tortillas, I found that one and a half were plenty for me, so this serves about four people. A couple of weeks ago we invited S and Dr A around for dinner. S is ethnically Indian, so when I asked "Asian or not-Asian" she leapt for the non-Asian option, at which point I started fretting - I didn't know what to cook! The old faithfuls, that always, always work, are curries and laksa and things with noodles. Venturing out of that territory feels like hit or miss, though I know, logically, that I am getting pretty good with it all. I've only had bruschetta a few times in my life, so I don't know how close this is to being actual bruschetta, but it was tasty and I believe it meets the general requirements (bread, fresh tomato, basil, not too much else), so I'm going to call it a success. Slice the bread into rounds, brush with olive oil, and bake at 150C for 15 minutes. 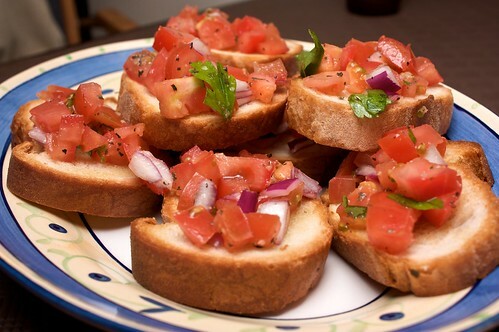 Meanwhile, as your kitchen is filling with lovely bread-baking smells, dice the tomato and red onion, and combine with shredded basil, shredded parsley, a dash or two of salt and pepper, and a little extra olive oil. Leave to sit, and when the bread is crisp , dollop the tomato mixture on top. Serve as soon as possible. I love the taste of five-spice. One of the first things I made my mum teach me to cook was five-spice chicken, marinated for hours and fried in the wok and baked. I remember watching her so many times as I was growing up, the noise of the wok and the smell of the spice and it was actually the last thing I cooked involving meat. I’ve put it out of my mind for years, unable to decide what could hold its shape and yet soak in the flavour of the spices. Potato wouldn’t take to the frying, and tofu would fall apart, and no other vegetable would have the right texture. I’m not a huge fan of tempeh, but in a wave of inspiration I decided to give it a go last week, and it went exactly the way that I felt it should, even though my five spice is a little old. The tempeh was spicy, and crisp, and that smoky, delicious flavour was just as I remembered it, and I made it again last night. You will need a gas burner, and a wok. You might get away with using a frying pan, but frying pan is a different style of frying and I take no responsibility for any lack of wok-hei or change in cookability that you may encounter. Mix together the five spice and the dark soy, until the spice has dissolved. If it’s looking a bit too overwhelming, add a dash or two of light soy. 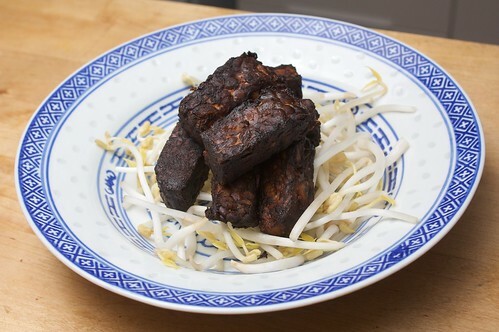 Slice the tempeh into fingers about 15mm by 10cm, then coat in the marinade. There should be enough marinade to coat the tempeh, and still have a bit of liquid floating around the bottom of the container. Sit for at least an hour in the fridge. Wok on the stove, burner up high. Put a little bit of peanut oil in a wok, no more than two tablespoons, and swirl around up the sides. Using chopsticks or tongs, place the tempeh first in the middle, where the oil should be starting to pool, and then up in the ring around the centre, where the flames hit the wok. Don’t do all of the tempeh at once, at least not if you’ve never used this technique before – perhaps do six or seven slices at one time. Turn each slice, occasionally but not constantly swirling the oil through the centre and up the ring (just when it looks like you need more oil up there), for about three or four minutes. Remove the tempeh to a tray, and continue wok frying until all the tempeh has been through the wok. Spread on oven tray, and bake on 180C for about fifteen minutes, turning halfway. 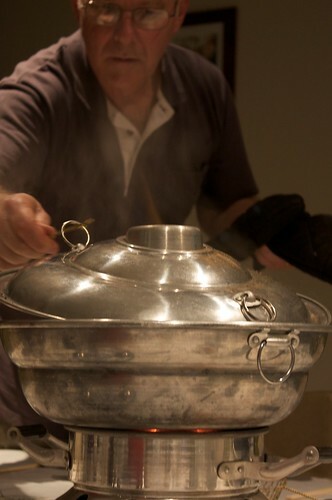 The wok crisps up the outsides, and the oven allows it to gently bake the flavour through. The oil left has this great crispy, spicy wok-hei kind of flavour, which last night I used to fry sliced mushrooms, something I will elaborate upon in another post. Serve the tempeh any way you please, I like to serve it on a bed of bean shoots or cucumber, or just eat it straight from the oven. Mum and I came back from Penang determined to have a steamboat before the winter was out. Yet here we were, mid-October and still no steamboat in sight. So last night we headed up to my parents' house, where we partook in one of my favourite methods of food preparation, the steamboat. Steamboat is a great way to have friends around for dinner, I like to refer to it as, what we have instead of barbeque. The steamboat sits in the middle of the table, either powered by electricity or more traditional means (in my parents' case, this means by heat beads), and has a chimney protruding from the centre of its bowl. Stock is poured into the bowl of the steamboat, and delicious things are dropped in to sort of steam but mostly boil in the middle of the table as the everyone surrounds the table, chatting. We serve with copper baskets and wooden chopsticks, with a ladle or two for the delicious broth which becomes more and more delicious as each course passes. The stock left by the end of the meal is delicious, having steeped in ten or twenty different flavours for the last two hours, it is my favourite. Last night we had two boats going, one for meat and not meat with chicken stock, and one for not meat with vegie stock. This worked pretty well, though we almost had a few careless moments with appropriate (not contaminated) implements. 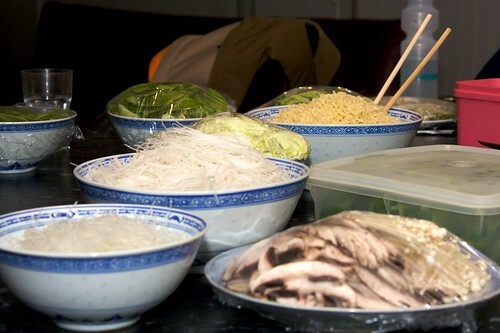 We had five courses in the vegie boat: tofu, chinese cabbage and choi sum (with rice noodles); fake fishballs with carrot and chinese cabbage (and maggi noodles); cauliflower, broccoli and carrot (with kuay teow noodles); giant button mushrooms with golden mushrooms; and snow peas, chinese cabbage and maggi noodles. The emphasis is on simple ingredients, and the mix of those flavours - no marinating beforehand, no flavouring with spices before cooking. Some light soy sits on the table, and we pour it into the tiny sauce bowls in front of us. The chillis, fried shallots, and spring onion gets passed around the table for flavouring, but we rely on the flavour of the broth and the flavour of the ingredients to combine and make tasty course after tasty course. It's sometimes frustrating that I still don't have a steamboat of my own, but I'll get one someday, and it will be awesome. For now, I promise my mum I'll help her prepare the vegies, and dance around her kitchen, like I have been for years. And it's great. I don't eat nasi goreng anywhere near as often as I would like to, because we usually eat up all the rice before it becomes old enough to goreng. Had it recently, though, because I knew I'd be home late the next day so I cooked an extra two cups to ensure nasi goreng the next day! I am so pleased with myself, I think I'll be using this trick more often. I got home from my German class to find D in the kitchen prepping the vegies, and there was a sanitarium vegie hot dog on the chopping board, it having been sliced into tiny circles. It was an interesting variation, it added a not-unwelcome hotdog flavour, though it is probably not a variation we'll add very often. Other variations of recent: diced eggplant, slices of tempeh. Speaking of tempeh, I made five-spice tempeh and it was just like I remembered from our five-spice chicken days, so much so that D accidentally said, "I'm going to get more chicken." Recipe eventually, but no photos yet so you'll have to wait. 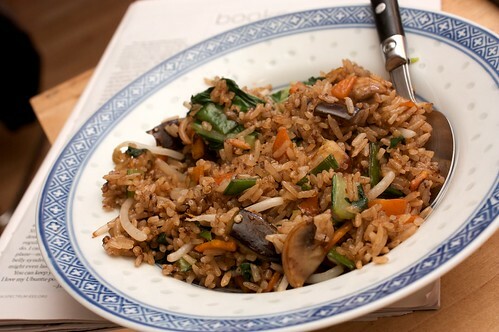 You can find my standard nasi goreng recipe here. Wandered down to Freo today to see MV Doulos, the floating bookstore. I love the idea of a ship that is a bookstore, sailing around the worlds bringing books and person-power to various countries. That's awesome! The bookstore itself was a bit average (and quite filled with books on Christianity), but it was, after all, a bookstore on a ship. Popped by the markets to see if there was anything new and interesting (there wasn't). Passing by Annie's Bread Stall, we noticed a tiny sign indicating vegan pasties and samosas, and they were gigantic. We felt we had to try them, though we were full, so we saved them for later. Having now eaten them for dinner (and our dinner now languishing in the fridge), they were pretty tasty! The flavour of the samosa in particular was pretty good. The pasty was a little too spinachy and unexpectedly mushroomy, but still good! And it's always lovely to find the surprise of random vegan food when out and about. Every four weeks or so I have to trot on out to uni for a three hour lecture that finishes about 20:30. By the time I get home I'm usually quite hungry, so D is left to prepare a hearty dinner that's going to be filling but won't weigh me down two hours before bedtime. Last night's lecture ended spectacularly early, it being the last of the semester, so when I get home D was still admist the preparations and somehow I ended up finishing cooking dinner, which was very tricky on D's part! It was an adaption of this recipe, but I think ours was probably more awesome, or certainly more to D's taste (D dislikes parsnips and celery). 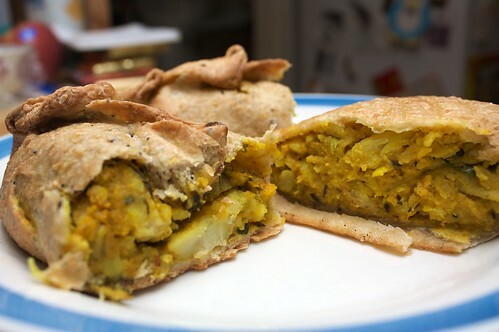 I think what makes this pie really tasty is cooking the lentils in stock, they soak up that extra delicious flavour. 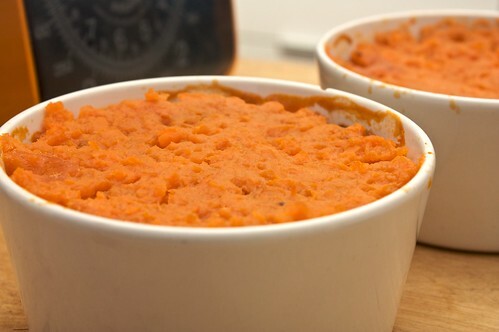 I've posted a lentil pie recipe here before, but where that one was more like a dahl lentil pie, this is more like a lentil shepherd's pie. Simmer the lentils in a few cups of stock for about half an hour, forty-five minutes. Fry the carrots and the onion until carrot starts to soften. Add garlic, followed by mushrooms. Fry until looking delicious, then add tomatoes and cook until the tomatoes just start to go mushy. Drain the lentils and add, along with pepper, soy sauce, pumpkin seeds, bay leaves, tomato paste and rosemary. Leave to simmer for five minutes. In the meantime boil and mash the potatoes in whatever is your preferred method. Divide in to four ramekins, top with sweet potato, bake at 200C for 20 minutes. The Perth Loves Earth Festival was held at the Perth Esplanade on Saturday. It was a day filled with intermittant rain, so the turnout was a bit low. There weren't a huge amount of stalls, just the ones you'd expect: PAWS, ARA, PACAT, Sea Sheppard. The food stalls were all shop-based, the Krishnas, Soul Tree and One World Cuisine. The highlight was a random little stall that was selling home-made vegan cakes and bikkies. 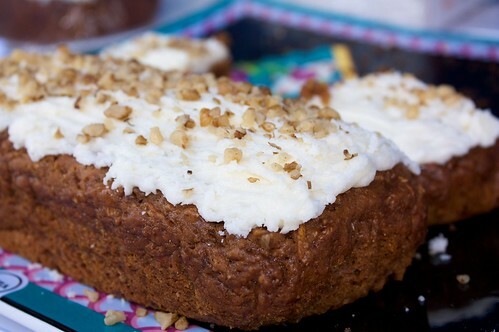 The carrot cake was fantastic, we even took a couple of pieces home. We've been meaning to trek up to Soul Tree for a while now, but have yet to wander up there. They were selling burgers, and they were incredibly tasty. We're thinking of making a day trip up the hill one day soon, perhaps going for a wander through John Forrest National Park (which is quite close by). I wasn't sure going in what the festival was going to be like. 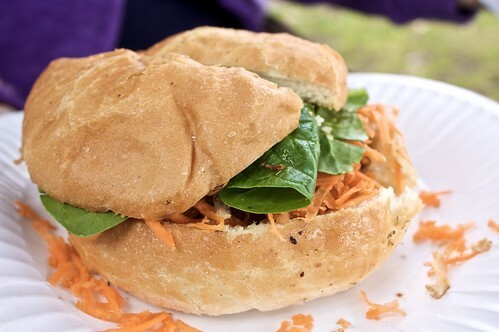 It was interesting to have a poke around, and I firmly believe in the ideal behind it, that vegetarianism is essential to environmental sustainability, but I didn't learn anything new. The festival itself was mostly just attended by hippies, and spoken word poetry is not the way to reach out to people who aren't already living the lifestyle. There's a sustainability fair being held this coming Sunday in Floreat, and I'm pretty confident it will go too far the other way, though - it will be all about PV and alternate energies rather than changing your life. I'll still go, in the hopes that I'll be pleasantly surprised, but I don't expect to get any delicious vegan cakes, for starters.